When you have a particularly flimsy or loose weave fabric you can have a lot of trouble maintaining structure in your garment and keeping the fabric from losing shape and stretching out. This is where underlining comes in. 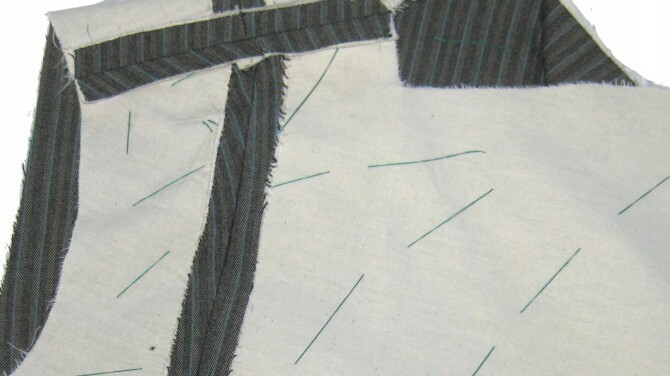 Underlining is an extra layer of fabric that you add to your fashion fabric to add extra structure. 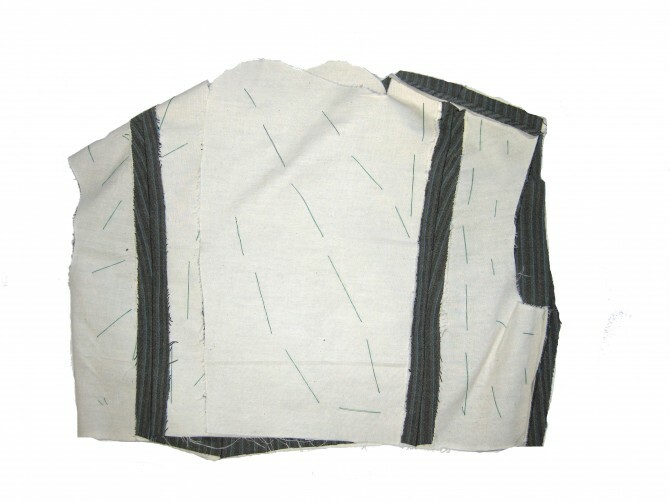 When you sew your garment you treat the fashion fabric and the underlining pieces as one. Please don’t confuse this with lining. To clarify, when you line a garment, you sew all the fashion fabric pieces together, then separately you sew all the lining pieces together, then at the end you join the two to finish the garment. 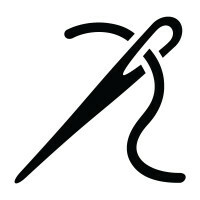 However, with underlining, you sew the fashion fabric pieces and underlining pieces together when you construct your garment. This is the inside of the coat I’m currently making. I used calico (thick cotton muslin) as my underlining because it’s affordable and had the stiffness that I was looking for (plus it’s what everyone else I know uses!! ), but I’m sure there’s someone out there selling a specific product! As you can see I hand basted the underlining pieces and the wool suiting pieces together to ensure that they would both act as one during the sewing process (can you say super tedious??). Then when I started putting together the bodice of my coat I treated the two pieces of fabric as one. A little tip for hand basting: I always leave the ends of the cotton on the outside/right side of the garment, that way when I need to remove the stitches when the garment is complete I don’t end up with random cotton knots stuck inside my garment. Obviously underlining results in a thicker, stiffer feel, so won’t be necessary in all sewing projects or even in all coats. I am using a wool suiting rather than a wool coating fabric to making this coat, so I really need the extra structure and support. I really wish I’d known about the wonderfulness that is underlining when I first started sewing… I can’t even count the number of things I made that didn’t work out/lost their shape/ended up looking funky because I didn’t know to underline them! What fabric are you using as an underlining? You could have also used a press-on interfacing along with the interlining or by itself depending on the fabric you’re using but calico is what i know most people use. Yeah I really don’t mind hand sewing, but there’s something about hand basting every single piece of a knee length coat that makes me want to scream!! But I still used interfacing on the collar and lapel as well as the underlining as those are areas that need extra extra support! Honey I understand your pain, I had to do it for my tailoring and couture courses last year. The A’s were well worth all that work though!